How to grab your futures employers’ attention when you are applying for a new job? How to draft a Preschool Teacher Resume that will impress it's readers! Download this Preschool Teacher Resume template now! This Preschool Teacher Resume template will grab your future employer its attention. After downloading and filling in the blanks, you can customize every detail and appearance of your resume and finish. Completing your Preschool Teacher Resume has never been easier, and will be finished within in minutes... Download it now! 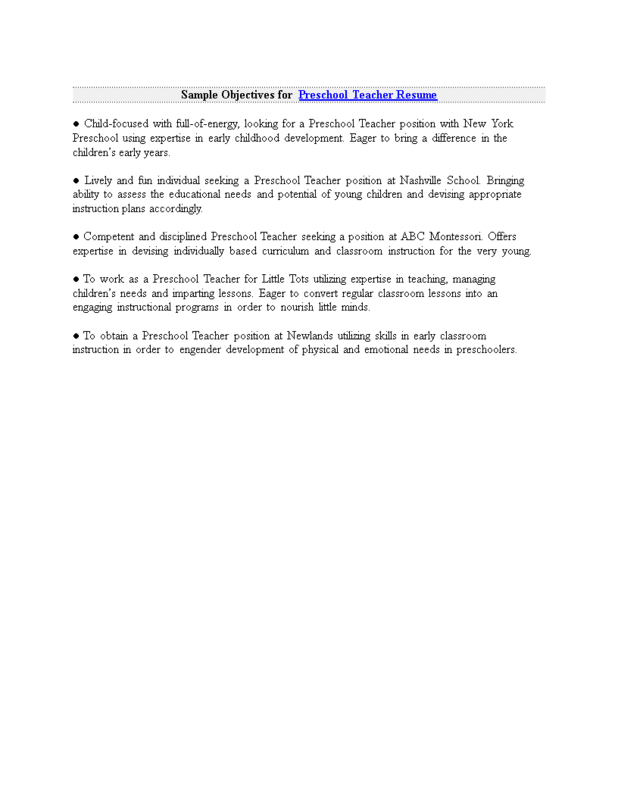 Sample Objectives for Preschool Teacher Resume Child-focused with full-of-energy, looking for a Preschool Teacher position with New York Preschool using expertise in early childhood development..